There are two pottery workshops at Taizé, both of them fully integrated into the life of an ecumenical community of some hundred brothers from thirty or so countries. Work there is part of this broader context, and explains a number of practical options. For, before being artists, be it as creators or as simple workmen, we are first of all brothers living a spiritual commitment in solidarity, today above all here in Taizé with thousands of young adults from all over the world. The ceramic adventure began in the winter of 1949. After Brother Daniel had met the potter Alex Kostanda at Cluny, a workshop was set up in Taizé which gradually developed, with the main focus on hand-turning and the development of stoneware glazes, mainly based on vegetable ashes. As the community grew larger, a second workshop came into being, since the brothers are obliged to cover their living expenses entirely through their own work; at the same time there is an awareness of the value of manual work. Most of the brothers working here, it should be noted, have some other activity within the community’s ministry. The production is therefore done using simple processes, some of them mechanized (such a form-turning, molding and casting) and the workshop produces objects for daily use with prices everyone can afford. Two simple processes have been carried over from the first workshop: the preparation of the clay from raw materials quarried locally and the creation of the workshop’s characteristic glazes. 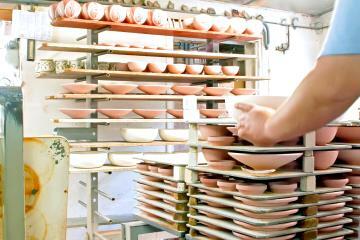 The clay composing the pots produced at Taizé is vitrified at 1280°C. 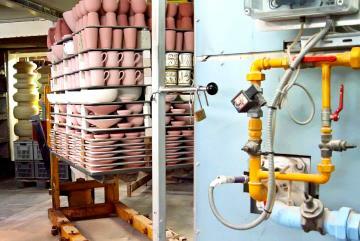 This produces the pottery known as “stoneware.” Before they are glazed, the objects receive an initial firing at 950°C. 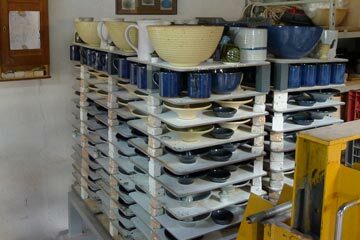 All our kilns use natural gas (methane). Certain objects (lamps) are made using a porcelain paste in a casting workshop. Stoneware glazes are silicates formed at 1280°C by the fusion of mixtures of various minerals : feldspar, kaolin, chalk, silica, talc. They may be colored by adding pigments such as iron oxides that produce ivory, green, black and brown glazes, cobalt or copper for blue and violet, titanium for orange-yellow. The glazes sometimes include vegetable ash composed of the minerals the plants drew from the ground. These ashes can also be reconstituted using the same proportions of minerals, as is the case for several of our glazes. For the first firing of our pieces, we work together with some local workshops, as an expression of solidarity with other potters: we are unable to keep up on our own with the demand. Gousseau (yellow) : the reconstitution of a glaze originally obtained using the ashes from a mixture of trees from the nearby woods known as the Forest of Gousseau. Omnia (dull green) : a glaze made by mixing various glazes. Blue : a glaze using a reconstitution of ash from the Bresse woodlands, enriched with cobalt oxide. Shinô (orange-maroon) : a Japanese glaze from the 16th century, rich in aluminum, originally discovered by Shinô Munenobu, the founder of one of the schools of the tea ceremony. Okoumé (dull gray-blue) : the reconstitution of a glaze made using the ashes of waste from an exotic wood formerly used in a local carpentry workshop. Temmoku (black with reddish touches) : a Japanese name for a classic iron-based glaze that originated in China over 1,000 years ago. Bois de Bresse (shiny white) : the reconstitution of a glaze made using the ashes of hedge trimmings from the Bresse region, not far from Taizé. 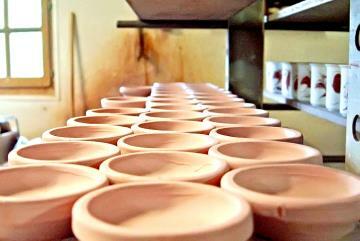 Hazel (bright, semi-dull brown) : the reconstitution of a glaze using hazelnut shells from Spain. Iron red (rusty brown) : an iron-based glaze containing phosphorus. Yellow : a glaze rich in alumina, enriched with titanium oxide. All the objects we produce withstand dish-washers and microwave ovens. They should not be placed in a very hot oven (above 200°C). Further technical information is available in the book The Practice of Stoneware Glazes: minerals, rocks, ashes available at the exhibition room, or by mail from Taizé. The produce of the workshops is sold in the exhibition room at Taizé. 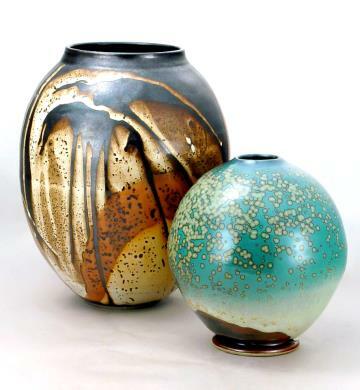 This guide, which is intended for both beginners and professionals, leads the craftsman or woman through a series of simple exercises into the great tradition of stoneware glazes made from rocks, minerals, or vegetable ashes. A collection of 60 fusion diagrams are maps to lead into the world of glazes. How to collect and identify ashes, and transform them into glazes that bring out the characteristics of each plant species. The Community regrets that it is not possible to buy pottery by mail order.